(2) ¼ “ square pieces, these need to be cut in half which will give you 4 triangle. Glue the frame together making sure the long pieces are on the inside edges of the shorter pieces. Glue the triangles into the corners, level with the bottom edges. This helps to keep the corners square. 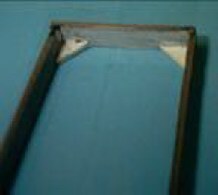 Stain or paint frame. I used minwax stain pen to stain the inside and outside of box. When this dried I used a white paint pen to paint the 2 short ends on the inside only. I did not do a complete coverage with the paint pen because I wanted it to look a little scuffy. 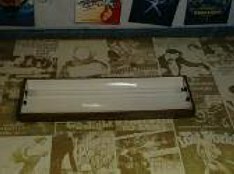 Next cut a piece of glossy photo paper 1/8th inch wider than the fixture box and the exact inside length the fixture box. Find the middle and fold the 2 sides to meet in the middle creasing the fold. Then open the folds making sure the glossy side of the paper is facing up. Now glue the paper into the box making sure you do not glue the paper flat on the edges. 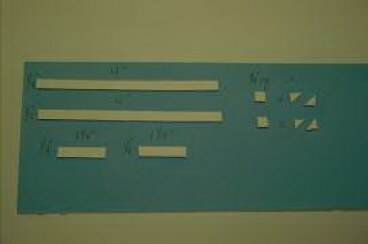 The edge of the paper should be glued to the inside top edge of the long sides only. This will give a slant on both sides if the paper. You can glue the short ends but I couldn't do that without making a mess. The pic above only shows the paper laying inside. I seem to have lost the pic showing it being glued. Cut the straws to 3 ¾ inches or the length of your fixtures inside measurement minus the depth of 3 seed beads. Put 2 seed beads on two of the pins and 1 seed bead on each of the other 2 pins, Gluing them as you put them on. The pins with 2 seed beads are for the light that is inside the fixture and the pins with only 1 seed bead is for the bulb that is out of the fixture. Wait for glue to dry before doing the next step. Put some glue on the end of the straw and insert the pins into the straw to about half of the depth of the first black seed bead. Do this on both ends of both straws making sure that you have the double beads on the same straw. When the glue is dry cut off the ends of the pins with wire snips. Cut close to the beads on the double beaded straw and Leave a little on both ends of the straw with the single seed beads. Put a dab of glue on each end of the double beaded straw and put in the fixture box making sure that both ends are even from the edges. Glue a black seed bead on inside of fixture box on both ends where second light would have been. For the light cover laying against the wall I just cut a piece a clear plastic the inside length of the fixture and slightly wider. I sanded it on both sides to make it frosted.